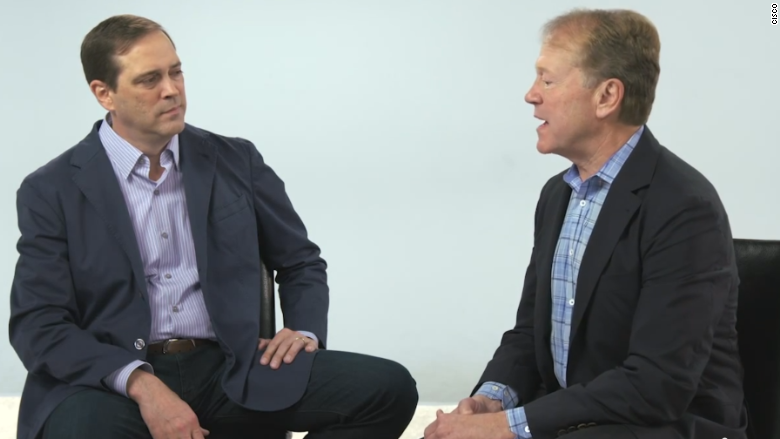 Cisco has named Chuck Robbins (left) as its next CEO, replacing John Chambers. For the first time in two decades, Cisco will have a CEO not named John Chambers. Cisco (CSCO) on Monday announced that longtime executive Chuck Robbins will replace Chambers as the company's chief executive. Robbins will officially take the networking company's reins on July 26, and he was named as one of the company's directors. Though the move isn't exactly a shock -- rumors of Chambers stepping down have been ongoing for years -- it's hard to imagine the company being led by someone else. Chambers, with his West Virginia twang in his voice ("we added billions of dollars in caysh"), has been the folksy leader of the Silicon Valley company, taking it from a promising router and switch business to a networking behemoth. Cisco reached $500 billion in market cap in 1999, a feat that had remained unbeaten until Apple smashed through that record in 2012. But recently, some of the shine has come off Cisco. The company has rapidly built up new businesses, such as video on-demand and supporting the "Internet of Everything" as its core router and switching businesses continue to slide. Yet it has at times been unable to avert the effects of the global economic downturn, and the company has gone trough several massive layoffs in the past several years. Robbins, who joined Cisco in 1997 -- six years after Chambers -- was most recently Cisco's head of worldwide operations. Cisco says Robbins' unit drives $47 billion in revenue for the company. "I am focused on accelerating the innovation and execution that our customers need from us," Robbins said, in a prepared statement. "At a time when our industry is on the cusp of more disruption than we've ever encountered, I couldn't be more confident in our ability to win, or more honored to lead this great company." Chambers will continue to serve on Cisco's board as chairman after he steps down as CEO. He called Robbins "a very strong leader." "This is the perfect time for Chuck Robbins to become Cisco's next Chief Executive Officer," Chambers said. "Chuck knows every Cisco segment, technology area, and geography, and will move the company forward with the speed required to capitalize on the opportunities in front of us."